After an encounter with Ravage, Wheeljack envisioned and witnessed a nightmarish future. He then began his every effort to avoid this tragic fate that would befall on him and his comrades. Wheeljack chose the Ford Binaltech body frame, known for its immeasurable strength and defenses as the base for his new form, installing it with one of the improved GT (Duplicate Unite) systems. His insatiable obsession towards survival can be seen in the form of his new body. However, his drive to obtain greater power and his obsessive devotion to his researches has become a major concern among his comrades. 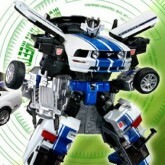 Wheeljack – Mustang GT toy information. 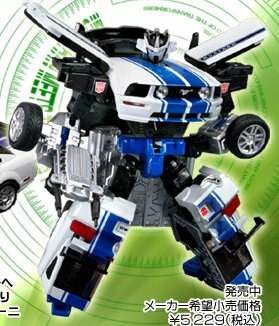 Wheeljack – Mustang GT parts information. Engine/Laser-Strafer Rifle (x1), Cryo-Sword (x1). Robot Mode – The BT-14 plan was initially conceived by Wheeljack, who believed the key to save the “War Dead of the Future” lies in the GT System, executed as part of the “Body Shop Project”. By dividing the lifeforce, the GT System allows the same personality to be duplicated. Since the completion of BT-07, this compatible slot has been installed onto all BT Autobots, but is only the second time it has been put to practical use since Smokescreen. Car Mode – Wheejack’s duplicate bodies are quite different from the similar BT-10 model body. The original “Alpha Unit” body with an added GT engine; then the “Beta Unit”, using the body frame built by Ford; and finally the “Omega Unit”, whose shape and specifications are still wrapped in a veil of secrecy. The Beta Unit, which used the BT frame body, has the biggest combat strength and it equipped with a back field propulsion panel enabling him to perform high speed flights. Weapons – The portable Laser-Strafer Rifle is a high output pulse laser that allows continuous firing. The blade of the Cryo-Sword is covered in an Immobilizer field which super-freezes and immobilizes the molecular activity on contact. As a result, the extreme temperature differences allows the sword to cut or break through any armor. 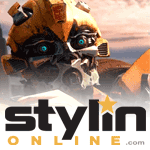 STORY OF BINALTECH - "PROJECT: BODY SHOP"
In the year 2005, with the victory of the Autobots, their home planet had finally been freed from the clutches of the Decepticons. However, a disgruntled Wheeljack ignored his comrades’ celebrations because he knew that this sudden victory was the work of an enemy from the future. Right before the end of the war, when Ravage had hijacked Wheeljack’s shuttle, he unveiled his plan to Wheeljack and even showed him images of the future from his memory. There, inside the attacked shuttle, he saw the discarded bodies of Brawn and Prowl, as well as the dead bodies of Windcharger and himself in a corner of Autobot City. “If I change this future, then at least some will be saved. But you will be terminated one step earlier here.” Barely escaping, Wheeljack was rescued by allied forces and subsequently witnessed the sudden change of history. The flow of time has changed indefinitely for now; however, is there a guarantee that they did indeed escape their deadly fate? If this reality is that of one twisted by evil, then what waits beyond this victory is a dreadful trap. It must be returned to its proper flow before it is too late – but that would also mean bringing the tragedy for his beloved comrades. Burdened by a heavy dilemma, Wheeljack pondered: “There must be a way to cheat death.” He immediately contacted Chip Chase on Earth.